You know you’re in good company when the short-firings of your brain are not only totally acceptable, but met with enthusiasm and embellishment. The following conversation commenced during a springtime walk in Copenhagen with two of my lovely and equally creative compatriots. L: Ahhh, it’s such a nice day! M: Totally! I have taken one of my many scarves off to enjoy it. M: Hey, look, this is where you can walk your croissant. L: Yes, it’s a very French area, right around here. P: That kid can barely keep up with the croissant! M: Croissants must be fast. L: Didn’t you ever wonder how French people stay so slender? It’s all the croissant walking. I’m pretty sure that with two extra white panels, the croissant would turn into a basketball. But who am I to interpret public wayfinding in a land where the entire month of December is devoted to eating æbleskiver? 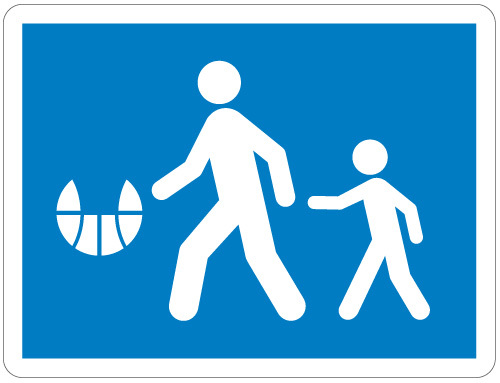 If you’d like to designate your very own croissant walking area, I’ve created a replica of this sign in various sizes. Download croissant crossing signs. Be the most croissant conscientious pedestrian you know.